Customizability is a big part of Scoro’s core, as it allows our customers to set up Scoro to meet the specific needs of their business. In addition to a personalised user experience, we’re also serious about saving time. With each update we’re making speed improvements, automating steps and adding the possibility to use templates where possible – all to make every second count. 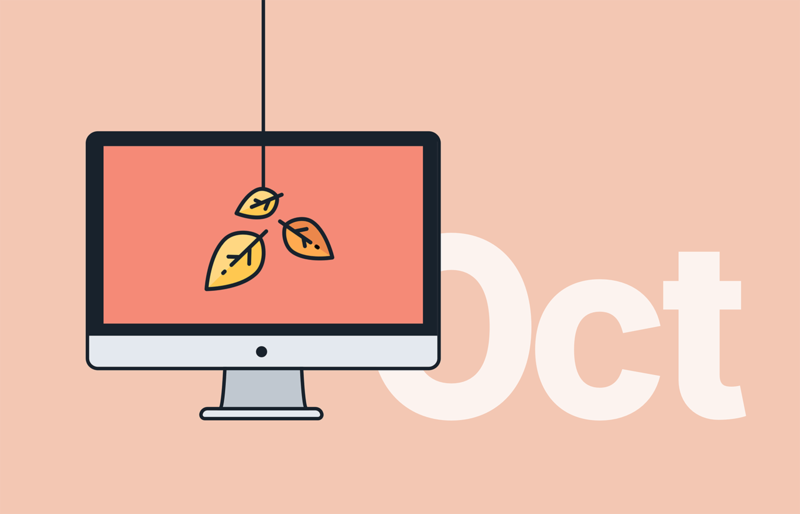 Let’s take a look at what’s new in Scoro. Wondering where all your time goes? Probably on doing the small stuff and making a number of clicks you could potentially save time on. Like said before, we take saving time very seriously and that’s why we’ve created project templates. No need to create a new project from scratch each time you confirm a deal with a customer. Instead, create numerous project templates based on your business model, or save an existing project as a template as you go. Tick the box “Save as project template” when creating or modifying a project. Just like that, the template is added to your system ready for use whenever you need to create a standard (for your business, at least) project. So, instead of spending time on filling in data for each new project, just pick a suitable one from your templates. Project templates are available with Scoro Ultimate plan. Though saving time on clicks is important, it’s also essential that the tool used for time tracking (among many other things) works fast and without hiccups. We’ve improved the speed in many views. As a result, the Task list, Planner, Budgets, Contacts list and contact detailed view are up to 10 times faster. The biggest visual improvement, on the other hand, that you’re going to notice, is the much wider screen viewport. It’s important because a well used space allows all the more room for valuable data. Statuses are used all over Scoro to give you information about… well, the status of different sales documents, tasks, projects, etc. and to help compile detailed reports. Many statuses are already there by default, but you can still make adjustments to them. Now, we’ve taken it a step further. With the new version of Scoro, you are able to truly customize the statuses used in your site. And by customizing we mean adding new ones wherever you need them, dragging and dropping their order as you please, and deleting the ones you don’t need anymore. This way, be it the task board, pipeline or some other view, the relevant data is always organized exactly the way you want it to be. Just go to Site settings > Statuses to give the statuses in your site a personal touch. Note! Customizable statuses are available with Scoro Premium and Ultimate plan. In addition to system statuses you can create altogether 10 statuses per module in Premium and 20 statuses per module in Ultimate plan. While some task deadlines are flexible to a certain degree, other assignments need to be finished by an exact date and time. Many of our creative customers have been manually changing the order of the tasks in their task list to make sure the tasks are completed in the correct order and in time. Instead of spending valuable minutes on reordering your list, you can now add a specific time of the day to the deadline of each of your task. This way the tasks are automatically sorted in the relevant order. All you need to do is start working! To bring even more structure to your work and set up exact deadlines go to Settings > Work and projects › Calendar and tasks and activate the setting “Use task deadline with exact time”. The Planner now differentiates between different types of holidays and only blocks out the days with holidays marked as “National holiday”. If needed, you can plan to work on certain holidays, just don’t forget to take some time off every now and then! Until now, when duplicating a task bundle, the original owner was also set as the owner of the new task bundle. We’ve fixed this, so now the new task bundle is owned by the user who created the duplicate. In the contact detailed view you can now also see the tasks and events not directly linked to the contact, but linked to the relevant project. 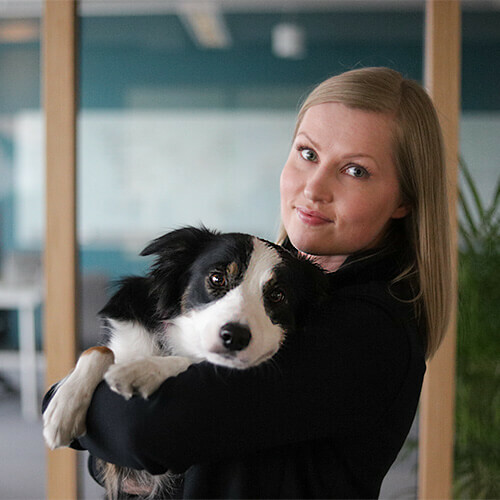 So, if the company or person is linked to the project as a client, all tasks and events under the project are automatically linked back to the company/person. You can see these activities in the contact detailed view listed under Planned activities and Past activities. 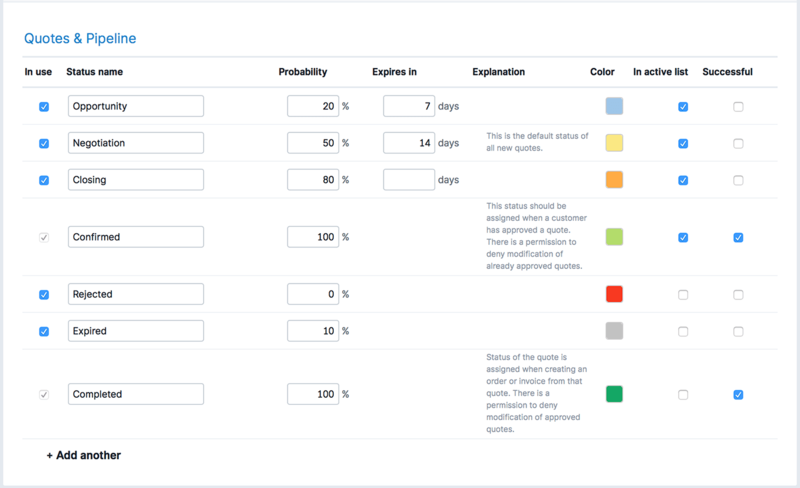 We’ve added some colors to the project list indicating the state of project deadlines. If the deadline has passed, the number of days over deadline is shown in red. The blue color shows that the project deadline is set for today or tomorrow. Days over deadline are also displayed in red in the project detailed view. The Planned activities section (for example, in project and contact detailed view) now displays tasks in the order they should be done in (listed by either nearest deadline or oldest creation date). This way you can take care of the most urgent tasks first and then take on the rest. The user filter now enables you to select multiple user groups. This makes it easy to add a calendar event to several user groups at once, filter different lists and reports by the relevant groups, etc. Read more on how to use different filters in Scoro. Instead of picking the columns to your list one by one, you can now add all different parameters to with one click. Just tick “Select all” under Viw options. Drag and drop the order of the columns as you please. There’s now a country filter in the detailed work report that allows you to filter out the work related to customers in specific countries. You can also add a Country column to your list by changing the View options. Whenever a company/contact person is linked to a task or event, the company’s/contact person’s country is taken into account when filtering out the results. When hovering over the project timeline, the preview window for tasks and events now displays both passed events and done tasks in the bottom of the list in grey. Coming events and undone tasks are shown on top of the list. This way it’s easy to get an overview of both already done and future activities. 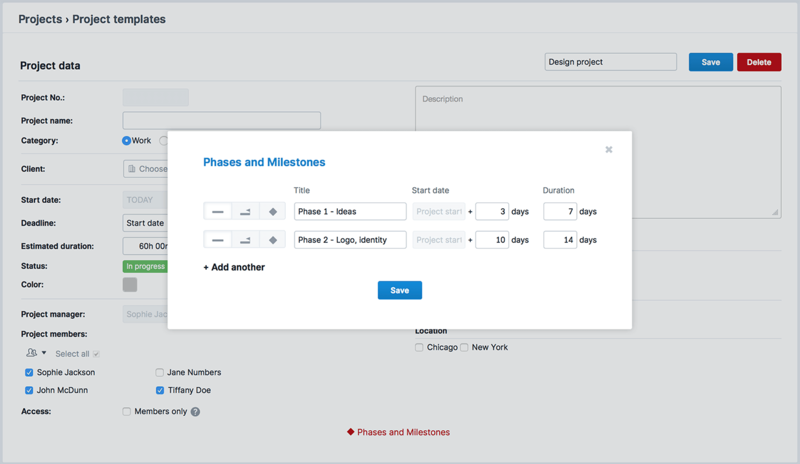 Instead of first creating a project and then adding phases and milestones in the project detailed view, you can now add them right away. Just click on the Add phases and milestones button at the bottom of the project modify view. If a project is shared between multiple company accounts, the project manager can now see all the project-related quotes in the project detailed view. This helps to get a full overview of all project-related deals. You can now sort your quotes list by two new parameters. Just by clicking on the Statuses column name, the list is sorted in the order that you have set the quote statuses under settings. The same works with the new Country column. In addition to many existing options, you can now add data on the Estimated closing date, Probability, Weighted value and Country to the Pipeline view. Just tick the new View options to see more information on your business deals without opening the quotes. When creating a new sales document (or project) for a client, Scoro now checks whether the client has any outstanding invoices and notifies you if they do. When selecting the client on the invoice, a red light bulb icon will pop up. When hovering over the icon, you can see the total of unpaid invoices and the prepayment amount related to the client. You can now easily update the selling prices on multiple scheduled invoices in the list view without opening the documents. This improvement makes it easy to update all scheduled invoices whenever you should change the price list for your services. Just tick the relevant documents (at least one) and click the button Update selling prices from product database on the additional options bar. You can now see exactly if and when a purchase order was sent to the supplier or customer. We’ve added a Sent column to the purchase orders list view. The same information is also visible in the purchase order detailed view. Sent data is added automatically when sending a PDF document in Scoro. Alternately, you can mark the document as sent by ticking the checkbox manually. Instead of opening documents one by one, you can now mark multiple bills as paid from the list view. Just tick the relevant bills and click the button Mark as paid. Just like that, the selected bills will be marked as paid with the selected date. There are now several new options in the Bills list view that help you stay on top of your billings. For one, there’s a new Chargeable filter in the list that allows you to filter out only those bills that are either Chargeable, charged, Chargeable, not charged or Not chargeable. There are two new columns that you can add to your bills list – Charged (already invoiced) and Not charged (still waiting to be invoiced) sum of the bill. Just tick the View options and drag and drop their order in the list. In addition, we added the icons already familiar from the project detailed view now also to the bills list. These icons indicate whether a bill is charged or partially charged. The icon is clickable and takes you to the linked invoices. All these additions make it effortless to track all expenses incurred, but still waiting to be invoiced. When compiling a sales document and selecting a specific price list, the system used to suggest all products when starting to add one on the document. We’ve improved our system, so now only these products are suggested for which a price has been set under the selected price list. We’ve added the possibility to hide the price lists created under one company from other company accounts. Thanks to this you can now use different price lists for each account, even though using a shared product database. As part of this improvement we also added a new permission that allows you to decide which user roles can view price lists created by other users in addition to their own. There are two new permissions in Scoro that allow the users of relevant user roles to modify contacts/projects of other users, if a member. In other words, the user needs to be either a member of the project or a related user for the contact to make changes. The custom fields added to companies are now automatically added to sales documents, even if creating a new document from scratch and then linking it to a company. So far, the information in the custom fields was carried over only when creating a document from the relevant company detailed view. Custom field option “Field is groupable in reports” is now also available for Purchase orders and Bills. Scoro now supports importing and exporting purchase orders. So, instead of entering data manually, you can now easily transfer all your purchase orders from a third party system to Scoro. It is now possible to import data on project budgets along with projects. We’ve added new example files to Scoro in order to make the import process clearer and easier to handle. We’ve improved our system so that “Is chargeable to the client” checkbox on Bills is now also supported over API. Bundle product data is now correctly displayed on all documents that are synchronized from QuickBooks. Product Code and Account Number information can now be synchronized between Scoro and QuickBooks. For all documents and products, the integration now supports up to four decimal points on the unit price field. We’ve moved the setting “Show time in the work report as:” from “Labor cost” settings page to the “Calendar and tasks” settings. This setting lets you adjust the time format used in the work report (e.g. 1:30 or 1.5 h). To be honest, the new placement is just a tad more logical. Time tracker. The simplest way to log actual work-time while doing an assignment. Plus, detailed and accurate reporting thanks to the hassle-free time tracking. Formula metric. Create custom dashboard metrics based on different bookmark formulas. Divide, multiply, add or subtract various results and quickly look into any data important to you. Timesheet view. Get a thorough overview of all work done in a straightforward timesheet view. At the same time, quickly add done activities or plan your next assignment.